Arts & Crafts oak wall shelf by Leonard Wyburd for Liberty. 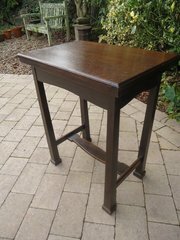 Offered in good original condition in fumed oak but with marks to top that should not show unless one was very tall. Height 26cms. Width 55cms. Depth 20cms. 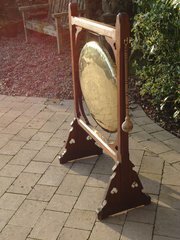 Large Arts & Crafts oak gong with pierced hearts to frame and sides of base. A design retailed by Liberty, Offered in good condition with minor remnants of spots of white paint which are difficult to move. The striker might be a replacement but makes a very loud bang enough to bright the whole street to lunch! The brass gong has been cleaned and is original to the frame. Height 111cms. Width excluding hook for beater - 74cms. Depth at feet 35cms. Lovely Arts & Crafts copper over mantle depicting a girl and two geese. It has its original bevelled edges mirror plate and a label to reverse with its provenance. We had to clean it to remove some very worn lacquer so at present its a little too shiny. Otherwise offered in good condition commensurate with age. The brass ones are more common in this design but rare in copper. Height 52cms. Width 92cms. 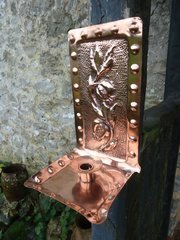 Arts & Crafts copper candle sconce with stylised seed heads and leaves and a border of raised roundels. Hook to reverse. Offered in a good clean condition, Height 23cms, Width 14cms. Depth 14cms. Unusual Arts & Crafts brass sconce with deep recessed well with stylised feathers behind holder which spreads the light beautifully. Offered in a good clean condition. Height 45cms. Width 17cms. Depth 11cms. Matched pair of Arts & Crafts mirrors with entwined swan detail. Nicely carved and heavy frames. These were once picture frames but have been glazed. Slightly different sizes which would not be obvious if not hung close together. Fixings in place to hang both as landscape and portrait. One frame measures 66cms x 51cms. The other 67cms c 48cms. 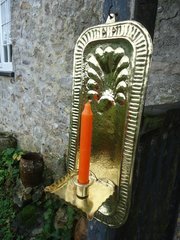 Pair of Arts & Crafts brass candle holders with stylish sweeping handles and a partly visible registration number as shown. The bases measure 12.5cms in diameter excluding the handles. They stand 9cms high and are offered in good condition. 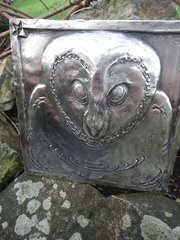 Interesting Arts & Crafts pewter plaque depicting an owl and signed what appears to read E Y Jones. This measures 13cms square and is heavier than appears. A fun item for any owl lover! 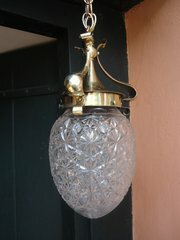 Arts & Crafts brass light with glass shade which appears cut glass but is pressed, The brass has been cleaned and comes complete with its chain and ceiling wooden fitting. Offered in good condition. The shade measures 22cms in height and 16cm wide. The height of the base of the shade to top hook is 34cms. Arts & Crafts fold over card table for Liberty - Ivorine label to underside. Closed - Height 76cms. Width 61ms, Depth 41cms. Open Height 73cms, Width 83cms. Depth 60cms. Offered in good original condition with slight split of felt at the point of the fold over. Lovely eight tiled set of Minton tiles designed by Henry Stacey Marks (1829 -1898) Believed to me called Solo. it depicts a pre-Raphealite lady covering her ears next to her squawking parrot in beautifully soft pastel colours. 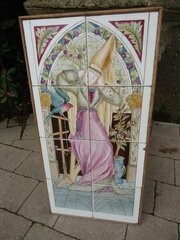 Henry ad a particular passion in painting colourful birds, especially parrots, The tiles measure 63cms x 31cms and are backed onto a wooden panel Condition - chip to third tile down on right hand side and thin crack to top right tile and a small chip to lower right. Arts & Crafts brass coal box with an owl to front. Excellent quality Arts & Crafts brass coal box with metal liner. The front has a lovely scene of an owl sitting on the moon. The top has raised strap hinges. Strong a very decorative handles to each side add to make this a very decorative item in any home. Offered in good condition. Height 35cms. Width 56cms, Depth 31cms.